Katy Daley-McLean was on great form for her 100th cap as England recorded their biggest ever win over the USA at Allianz Park. This rainswept game decided in the 14th minute with a red card for USA prop Megan Rom – perhaps a little harsh, but it turned what was always going to be a difficult peak for the visitors into climb into something of Everest proportions. But it was massively to the USA’s credit how well they performed. 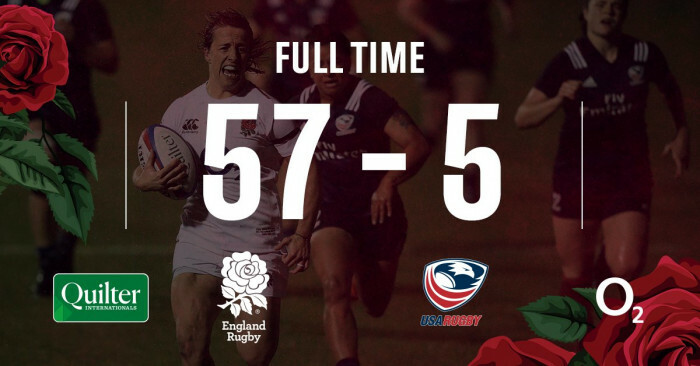 The score does not reflect that – the headline is “a record win for England against the United States”, but they gave as good as they got and you had to wonder how the game would have gone but for that red card. How it did go was that England dominated the opening 8 minutes, with the USA barely getting a hand on the ball until they were restarting after Leanne Riley’s try. England were on top up front, and from a 5m scrum – won thanks to a great kick through by centurion Daley-McLean – a try seemed inevitable, and was. The USA battled back, however, and penned England in their half for the next six minutes... until the red card, apparently for a high tackle involving the head. Even so, England took another ten minutes to take advantage, patient build-up play eventually putting Sarah McKenna in under the posts. 14-0. A penalty try followed ten minutes later, resulting in a yellow card for Kate Zachery, and two more England tries before the break, the best being Daley-McLean’s 50m run for the line – a try which Simon Middleton said he feared will be repeated and replayed by its scorer in great detail for weeks to come! 33-0 at halftime quickly became 40-0 with Lydia Thompson finding room against the USA’s 13 players, but after that things began to slow down. The USA got back to 14, and the benches came into play, with the USA’s replacements more fired up than England. Sarah Hunter’s try took England to 47-0 after 53 minutes, but the next 20 minutes were very even, England being repeatedly held up by heroic USA defence before on 75 minutes the USA deservedly got on the board through Jennine Duncan. That achieved, USA perhaps relaxed a little and England struck back in the final couple of minutes with two tries from Kelly Smith and Carys Williams.